Shoaib Akhtar ( pronunciation ; born 13 August 1975) is a former Pakistani cricketer, who played all formats of the game for fourteen years. 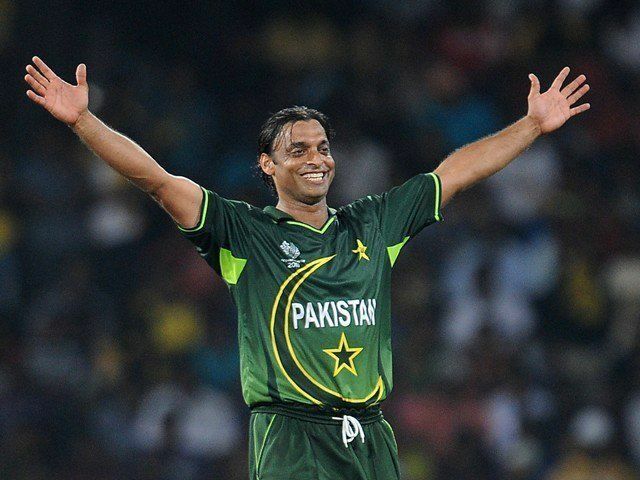 Regarded as one of the best fast bowlers to ever played the game, Akhtar is the fastest bowler ever in the history of cricket, who delivered the fastest delivery officially recorded at a top speed of 161.3km/h in a pool match against England in the 2003 Cricket World Cup. Akhtar was nicknamed as "Rawalpindi Express", as a tribute to his hometown and fast bowling. He is the first bowler to break the 100mph barrier as well, which he did twice in his career. Akhtar made his Test debut in November 1997 as an opening fast bowler and played his first One Day International three months later. Akhtar has been involved in several controversies during his career, often accused of not being a team player, but was also commended for significantly impacting games in Pakistan's favour. Akhtar was sent home during a Test match series in Australia in 2005 for alleged poor attitude. A year later, he was embroiled in a drug scandal after testing positive for the performance-enhancing substance nandrolone. However, the ban imposed on him was lifted on appeal. In September 2007, he was banned for an indefinite period for a fight with Pakistan team mate and fast bowler Mohammad Asif. On 1 April 2008, Akhtar was banned for five years for publicly criticising the Pakistan Cricket Board. In October 2008, the Lahore High Court in Pakistan suspended the five-year ban and Akhtar was selected in the 15-man squad for the Twenty20 Quadrangular Tournament in Canada. Pakistani judge Rana Bhagwandas once stated that Akhtar is a legend of Pakistan cricket. Akhtar retired from international cricket after the 2011 World Cup. Akhtar was born in a small town in Morgah near Rawalpindi, Punjab in Pakistan. His father was a plant operator at the Attock Refinery. Considering his subsequent high profile in cricket, Akhtar's test career started rather modestly. He was first picked to play on his home ground in Rawalpindi during the 2nd Test of the West Indies 1997/98 tour of Pakistan. He was subsequently included in the tour of South Africa during the winter of 1998, where he played in all three tests. He was notably the spearhead of a depleted Pakistani bowling attack in the Peshawar Test against the visiting Australians later in 1998, when Mark Taylor scored his famous 334 n.o. in Australia's first innings. Subsequently, after 8 tests and 16 innings, Akhtar had accumulated only 18 wickets to his name. Akhtar's run of impressive performances started in 1999, during a pre-World Cup series against India. It was followed by outstanding bowling performances in Sharjah and later in the 1999 Cricket World Cup. His most significant performance was in India in 1999 when he captured eight wickets in the Asian Test championship match at Calcutta – including the wickets of Indian batsmen Rahul Dravid and Sachin Tendulkar when he bowled both batsmen off successive deliveries. It was the first ball he ever bowled to Tendulkar. In 2002, he was selected for the Pakistan team against Australia and achieved success. However he performed poorly during the 2003 Cricket World Cup and after the tournament he was dropped from the Pakistan squad. He was selected back into the Pakistan squad in the 2004 Test match series against New Zealand, but struggled in a losing Test series against India in 2004. The series ended with a controversy when he left the field citing an injury leading to suspicions by former Pakistan captain, Inzamam-ul-Haq, about his commitment to the team. As a result, his relationship with Inzamam-ul-Haq and former Pakistan coach Bob Woolmer deteriorated. A medical panel was set up by the Pakistan Cricket Board to investigate the nature of his injury, however Pakistan officials dispelled all suspicions. Shoaib Akhtar is known as the fastest bowler ever in the history of cricket and has bowled the fastest delivery officially recorded at a top speed of 161.3km/h. Akhtar has a number of fast bowling records. He has bowled at speeds of 159.3 km/h, 160 km/h, 159 km/h and 158.4 km/h. The fastest was against England in the 2003 Cricket World Cup when the ball was recorded at 161.3 km/h. The next fastest three were against New Zealand in 2002 and the other three were against Sri Lanka in the same year. He is the first bowler in the history of cricket to have been recorded to bowl over 100 mph. On 29 October 2007, Akhtar made his return to cricket, from his 13 match ban and performed well, taking 4 wickets for 43 runs against South Africa in the fifth and deciding One Day International series in Lahore in Pakistan. Subsequently, he was included in the 16-man Pakistan squad for the 2007 tour of India, which he completed successfully without further incident and injury. Akhtar made a return to international cricket albeit in the shorter format of the game. In May 2010, PCB named him in a list of 35 probables for the Asia Cup. On 15 June 2010, Akhtar made his return, taking 3 wickets for 28 runs in the first match of the Asia Cup against Sri Lanka. He narrowly missed out a spot in the 2010 ICC World Twenty20 in place of the injured Umar Gul. In July 2010, he was selected for the Twenty20 series against Australia but the selectors decided not to play him in the Test squad so that he would not get injured. He was subsequently selected for the ODI and Twenty20 series against England in September 2010. Akhtar returned to the national side representing the country against England in the Twenty20 International. He bowled an impressive spell and returned with figures of 2 wickets for 23 runs. He continued to bowl well in the ODI series in the absence of regular fast-bowlers, Mohammad Asif and Mohammad Amir, who were suspended by the International Cricket Council amid allegations of Spot-fixing. Despite his relatively good bowling form, Pakistani coach Waqar Younis insisted that the bowling attack must not become reliant on Akhtar, as he is 35 years of age and fitness troubles continue to affect him. Akhtar was selected for the tour of New Zealand and started his campaign off well with 3 wickets on Boxing Day in the first of two Twenty20 Internationals against New Zealand. Akhtar was selected in Pakistan's 15-man squad to play in the 2011 World Cup hosted by Bangladesh, India, and Sri Lanka in February to March. During the tournament, he announced that he would retire from international cricket at the end of the World Cup. He was dropped from the squad after group matches and was not included in the quarter final either. In September, Akhtar released his autobiography, Controversially Yours. Akhtar has played for three English county cricket clubs: Somerset in 2001, Durham in 2003 and 2004 and Worcestershire in 2005. He did achieve his moments of success, such as taking 5 wickets for 35 runs for Durham against Somerset in the National League in 2003 and claiming 6 wickets for 16 runs in the same competition for Worcestershire against Glamorgan two years later, but he suffered from fitness problems, as well as a perception that he was less than interested in his task. This was particularly the case at Worcestershire: chairman John Elliott said "Players like that are no good to our club. In fact, Akhtar has been no good for any club he's been at. He's a superstar and just does what he wants." Akhtar made a successful return to cricket in his first game in the Indian Premier League, playing for the Kolkata Knight Riders against the Delhi Daredevils. Defending a low score of 133 runs, Akhtar took four top order wickets which ultimately led to the Daredevils being restricted to 110 runs. He ended with figures of 4 wickets for 11 runs from three overs, a performance which earned him the player of the match award. Akhtar denied that he had any point to prove with his performance, stating, "I just wanted to win the game." 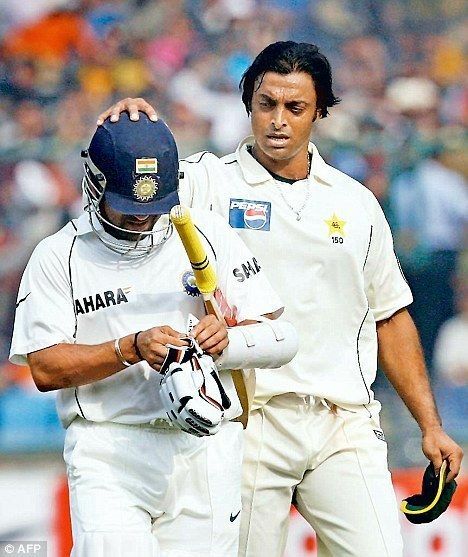 Knight Riders' captain Sourav Ganguly also acknowledged Akhtar's performance, "He came to the country with lots [of things] happening behind him...But he showed a lot of character." It has been widely reported that the Knight Riders have released Akhtar from his contract due to his injury history but the Knight Riders' officials have denied these reports and said they are still in talks with the fast bowler. He has also played for Cyclones of Chittagong in Bangladesh's NCL T20 Bangladesh. Akhtar's career has been plagued with injuries, controversies and accusations of poor attitude. After rising into international stardom at a young age due to his speed, due to his interesting personality and charisma glamour seemed to follow him, some say at the detriment of his sporting focus. Although he eventually crossed the 100 mph barrier, his attitude took its toll on his reputation as well as his fitness. After a poor performance in the 2003 Cricket World Cup, he got involved in a verbal conflict with former Pakistan captain and fast bowler Waqar Younis. Later on Akhtar was sacked along with other players, including Younis. In a triangular series in 2003 held in Sri Lanka, he was caught ball tampering making him the second player in cricket to be banned on ball tampering charges. The same year he was banned for one Test match and two One Day International matches for abusing South African spin bowler Paul Adams, during a match against South Africa. In the 2004 home series with India, he struggled with wrist and back injuries, which raised questions about their commitment to the team. His relationship with the captain and the coach deteriorated further partially due to team politics. He was sent back from the 2005 Australia tour with a hamstring injury amid rumours of indiscipline, lack of commitment and attitudinal complaints. He was subsequently fined by the Pakistan Cricket Board for avoiding a late night curfew. The rest of his cricketing career was riddled with ankle and knee injuries which forced him to undergo a surgery in February 2006, until finally he was banned for two years for allegedly using performance-enhancing drugs. In November 2006, an officer assigned to the Pakistan team in India, Anil Kaul, alleged that Akhtar had slapped former coach Bob Woolmer following a fight over the music to be played in the team bus on the eve of ICC Champions Trophy. Both Akhtar and Woolmer have strongly denied these allegations. On 16 October 2006 Akhtar was suspended by the Pakistan Cricket Board, along with Mohammed Asif after they tested positive for a performance-enhancing substance nandrolone. They were consequently pulled out from the 2006 ICC Champions Trophy. Former Pakistan Cricket Board chairman later stated that he had always suspected Akhtar of substance abuse due to his consistent "reservations" to drug tests. Former Pakistan captain Inzamam ul-Haq had also previously complained about Akhtar's drug abuse but was not reported to the Pakistan Cricket Board. Pakistan news reports state that federal capital police had arrested Shoaib along with drugs some three years ago. Akhtar immediately declared his innocence and he declined knowingly taking any performance-enhancing drugs. In a statement issued to the press, he claimed that he could never cheat team-mates or opponents. During a hearing with the Pakistan Cricket Board Anti-Doping Committee, he along with Asif maintained taking non-steroidal dietary supplements. He, however, failed to convince the committee of his innocence. In its report submitted to the Pakistan Cricket Board and the Anti-Doping Committee recommended a two-year ban. On 1 November 2006 the Pakistan Cricket Board handed down a two-year suspension to Akhtar and a one-year suspension to Asif, banning them from professional cricket during the period. Shoaib had subsequently been added to Pakistan Olympic Association list of doping offenders. However, on 5 December 2006 represented by his lawyer Abid Hassan Minto, Akhtar was cleared on appeal. On 5 December 2006 Akhtar and Asif were acquitted by the tribunal appointed to review their appeals against the drugs ban imposed on them by an earlier committee. After a clear hearing from Akhtar's lawyer Abid Hassan Minto, the three-man committee, headed by Justice Fakhruddin Ebrahim, voted two to one in favour of the acquittal. Haseeb Ahsan, former Test cricketer and Ebrahim were in favour of the acquittal while the third member, Danish Zaheer, dissented. "Exceptional circumstances" were cited including discrepancies between the instantaneous offence charges of doping that were laid and the quick delivery of a very harsh verdict. The complete drug testing procedure was concluded to have been technically flawed as it did not follow standard procedures. Other established facts by the committee included that the duo were not aware of the banned drug to be present in their supplements because the Pakistan Cricket Board itself had not informed them of the dangers of contaminated supplements. Both Akhtar and Asif were thankful to the Pakistan Cricket Board chairman Nasim Ashraf for giving them a fair trial and their team mates, captain and coach for the moral support. However, in 2006, they did not play in the Test match series against the West Indies because the Pakistan Cricket Board has recommended that they play domestic games first to recover form and fitness. However, WADA, the World Anti-Doping Agency, was to challenge Pakistan's decision to lift bans on fast bowlers Akhtar and Asif by taking the case to the Court of Arbitration for Sport in Lausanne, Switzerland. The ICC, cricket's world governing body, has supported the WADA appeal adding that it was committed to a dope free game. On 1 March 2007 Akhtar and Asif were ruled out of the Pakistani squad for the 2007 Cricket World Cup by team officials, minutes before the squad was to depart for the West Indies. The team management along with the Pakistan Cricket Board said their injuries were too severe to risk taking them to the Caribbean. Since neither of the two had been declared fit they had not undergone official doping tests. On 2 July 2007 the Court of Arbitration for Sport dropped the case, ruling it had no jurisdiction to challenge the decision made by PCB. On 21 May 2009, Akhtar was dropped from 2009 ICC World Twenty20 Pakistan squad supposedly because of genital viral warts, previously reported as a skin infection, however it was later confirmed that this was untrue, as the PCB giving false statements, with an aim to damage Akhtar's reputation. In August 2007, Akhtar was reported to have used foul language against Pakistan Cricket Board protesting the imposing of fine of Rs. 300,000 for indiscipline during the national camp in Karachi. In the week before the inaugural World Twenty20, held in South Africa, Akhtar was rumoured to have hit Pakistani team mate Mohammad Asif with a bat, leaving a bruise on his left thigh. According to sources, the two were involved in a dressing room spat which resulted in Asif being struck by a bat on his left thigh. Sources said the fight between the two started after Asif and Shahid Afridi disagreed with Shoaib that he shared the same stature as Imran Khan in Pakistan cricket and even ridiculed him for making such a comparison. The injury was not thought to be anything more serious than a bruise but a team investigation into the matter was pending. After the initial inquiry, it would found that Akhtar was at fault and he was subsequently recalled from the Twenty20 World Cup squad and was sent home. He was also banned for 5 matches by the Pakistan Cricket Board and a lifetime ban may also seem imminent. Akhtar later claimed that Afridi was responsible for the fight, saying "He made some ill remarks about my family. And I could not tolerate them." Afridi however, denied these allegations adding that Asif would have suffered more injuries but for his intervention. Even Asif chipped in saying that Akhtar was lying and that "Shahid Afridi had nothing to do with the fight", saying that "he has not apologised to me." Akhtar later patched up with his team mates including Afridi and Asif. On 1 April 2008 Akhtar was banned for five years for violating the players' code of conduct. The ban extended to all cricket for and in Pakistan. Despite the ban not preventing him from playing in the Indian Premier League, the IPL governing council decided not to allow Akhtar to play in the tournament until the end of the ban or unless it is lifted. IS Bindra, a member of the council, was quoted as saying, "Even though they [the PCB] have cleared him to play for IPL, we felt that international discipline needs to be respected." Meanwhile, Akhtar vowed to go to great lengths to fight the ban, "I will appeal, as is my right. If that fails I will go to court, if that fails then I will go to the Supreme Court." On 3 April, Pakistan Cricket Board chairman Nasim Ashraf served a legal notice on Akhtar, calling on him to retract statements he made to a news channel, alleging the ban was punishment in return for refusing to give the chairman a share of his earnings from the Indian Premier League, Ashraf also sought damages of Rs 100 million (approximately US$1.6 million) for "defaming him personally" and an additional Rs 100 million to the Pakistan Cricket Board for "sullying the name of the Pakistan Cricket Board and the Pakistan Cricket team." A three-man appellate tribunal announced on 30 April that they had temporarily upheld Akhtar's five-year ban, deciding to revist the appeal hearing in June. Despite Akhtar's later retracting his claims and also issuing an unconditional apology for "any grief or embarrassment that may have been caused to the nation, particularly to the Pakistan Cricket Board chairman Dr Nasim Ashraf", Ashraf's legal counsel filed a Rs 220 million (approx US$3.37 million) defamation suit against Akhtar in a civil court in Lahore on 2 May. On 4 May, the Pakistan Cricket Board's appellate tribunal suspended the five-year ban for one month, until they reconvene on 4 June, allowing Akhtar to take part in the ongoing Indian Premier League. A day later, the Pakistan Cricket Board announced that they will no longer pursue the defamation suit following a reconciliation between Akhtar and chairman Nasim Ashraf at the house of Rehman Malik, a key political official, in Islamabad. "My honour has been vindicated and now the defamation lawsuit will not be pursued," Ashraf was quoted as saying. On 4 September 2008, Akhtar was sent home by British immigration officials after landing at Heathrow airport without a valid working visa; authorities said he could not play without a working visa, though Akhtar had a valid visa to visit England but not a working visa, which is a prerequisite to play in county cricket. He subsequently obtained the necessary visa and returned to play with English county club Surrey. Akhtar also threatened to sue the Pakistan Cricket Board after it was revealed that he had apparently contracted a sexually transmitted disease (genital warts); however, this claim was found to be false, with an aim by the PCB to damage his reputation, but he threatened to sue after the false statements presented by the PCB. In July 2012, Akhtar accused the PCB stating that there was too much "politics" in the Board and some of its officials did not want Pakistani team to win. Shoaib married Rubab Khan on 25 June 2014.